The cost of labor can be managed effectively when restaurateurs are equipped with the right training, tools and processes. Traditional methods for capturing critical forecasting data and formulating labor plans & budgets are incomplete and often inaccurate, rarely accounting for menu pricing changes or current economic conditions. Even when the best practices of forecasting are employed, the information isn’t always available to the store managers who are attempting to manage the cost of labor. 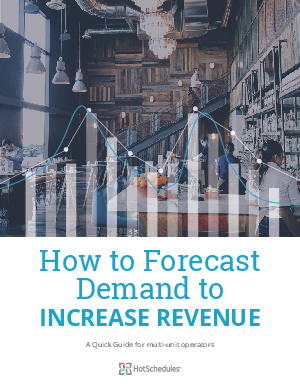 This ebook will walk you through the ins and outs of labor forecasting and best practices to build efficiency, grow revenue, and positively impact your restaurant’s bottom line.